Mark in L.A. took the concept up a notch by adding a small extension to the side and thereby expanding the space, and complimenting the design. 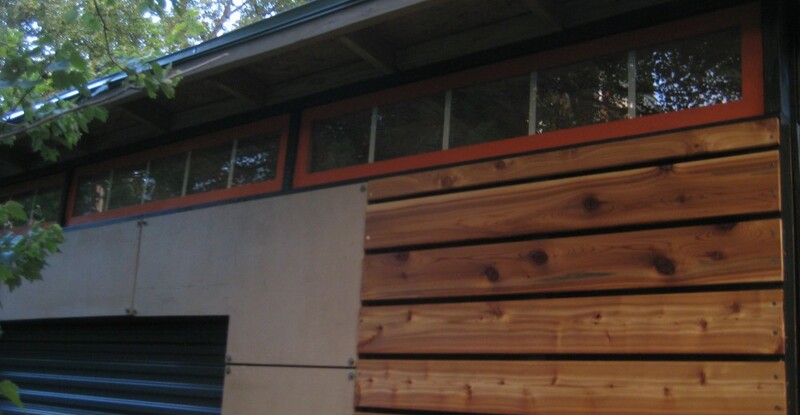 I love the clean, light lines of the siding boards and the use of vertical roofing panels for siding accents. Interior of shed by Ron and George. The shed is now being used as a music studio by George and his young assistant with the classic Ramones’ T! More progress by Eric in Austin, Texas. Eric’s shed is almost complete! It’s been a few months since I first published DIY Modern Shed Plans, and a few of those who purchased it have been kind enough to share some photos and feedback from their own projects. One of my goals for starting this blog was to create a community for DIYers like me to share ideas and inspiration. On this post I will start a gallery of projects that others share, along with comments about the process. If you are reading this and would like to share your project here, please email your photos (and indicate permission to post) to me at: petermayx@gmail.com.